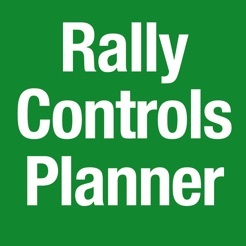 The Rally Controls Planner app is designed to help Rally Masters layout a course and identify possible locations for controls, route changes, or other typical rally actions. Time and distance measured from the start of the first control (Control #0) are computed by from GPS coordinates. The time, speed, and distance shown at the top of the screen are continuous measurements and computations from the start. The time, speed, and distance shown immediately below the map are measured from the prior control to the current position along the course. 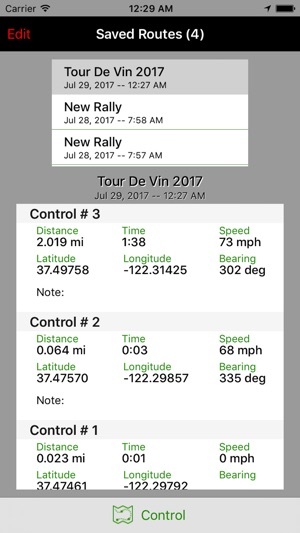 When the "+ Control" button is touched, these amounts along with the latitude, longitude, and heading at the control are added to a list. 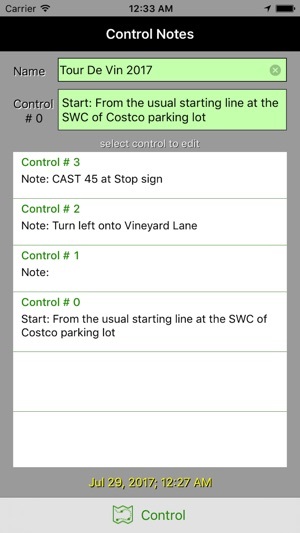 Additionally, a note for that control number is added and available for editing on a pop-up view accessed by touching the "Note" button or icon in the lower right-hand corner of the screen. Touching the "Pause" button will stop time, speed, and distance measurements, which is especially helpful if you stop to make notes. 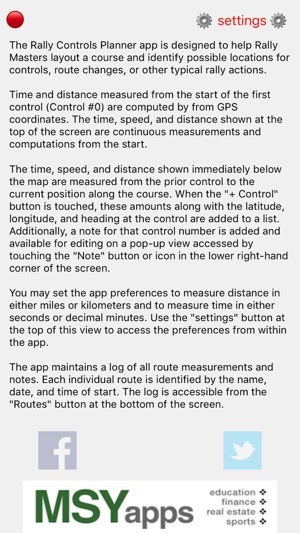 You may set the app preferences to measure distance in either miles or kilometers and to measure time in either seconds or decimal minutes. Use the "settings" button at the top of the "About" view to access the preferences from within the app. 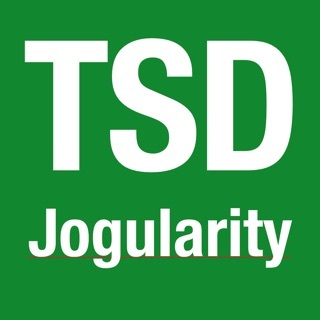 The app maintains a log of all route measurements and notes. Each individual route is identified by the name, date, and time of start. The log is accessible from the "Routes" button at the bottom of the screen. 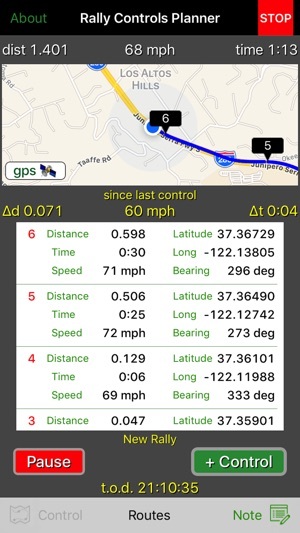 The "GPS Info" button on the map will show data received from DUAL 150 or 160 model GPS receivers, if the device is within range of your iPhone's Bluetooth receiver and Bluetooth is turned on.